PreWorkout – Pour contents directly in your mouth or mix in 6-8 ounces of water to focus on muscle enhancement, endurance, boosting energy, and an increased metabolic rate by sending a short-term jolt through your body just 10 to 15 minutes prior to a workout AdvantraSlim – Take 1-2 times daily 30 minutes before mealtime. Mix with 16 oz of water and drink entire contents. Get the combined benefit of our PreWorkout and AdvantraSlim products. PreWorkout gives you everything your body needs to perform at your best and maximize your workouts. Pour this amazing formula straight into your mouth and get after it! 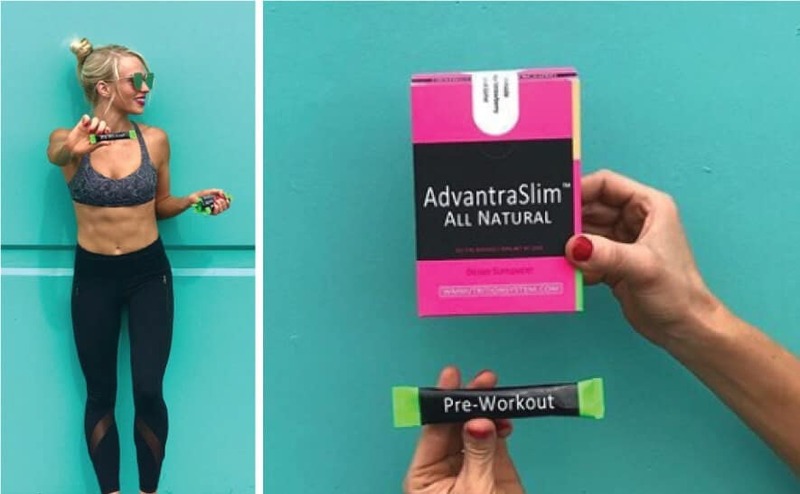 Our flagship product AdvantraSlim contains 2 clinically proven ingredients (Slendesta and AdvatnraZ) that curb your appetite and jumpstart your metabolism. Many people wonder why they need a pre-workout supplement at all. The fact is that a preworkout can be essential to achieving your fitness and training goals. A pre-workout supplement allows you to train at your full potential. It unlocks your mind and body’s ability to push past limits that it would normally be unable to cross. The extreme focus and intensity a pre-workout gives you will allow you to train hard enough to make real progress in the gym and break through plateaus. Slendesta is a branded form of protein, sourced from white potato extract. It is affective as a craving crusher compound due to its ability to make you feel full, longer. The release of this white potato extract has a protein that can help your brain feel like you have eaten enough food. This way, you won’t feel hungry for up to 4 hours. This protein is proteinase inhibitor II (PI2) and helps release a peptide known as cholecystokinin, a compound that is naturally produced by the digestive system. This peptide sends signals to your brain that you are still full, establishing satiety in the process. According to a study by NCBI, a composite weight loss dietary supplement (slendesta included) has shown to help decrease body fat, increase lean body mass and increase HDL (good cholesterol). The study gives real evidence that slendesta can help prevent obesity and may also induce health improvements. AdvantraZ AdvantraZ is the commercial name for bitter orange. Bitter orange has been in the spotlight for years due to its effective and naturally, potent weight loss abilities. Bitter orange is known to help treat kidney and bladder disorders, liver and gallbladder diseases, diarrhea, constipation, hair loss, cancer, joint pain, headaches and many others. According to NCBI, a combination of p-synephrine and bitter orange extract increases metabolism and energy expenditure. Though AdvantraSlim doesn’t have p-synephrine, it does give 80mg of caffeine per serving. Caffeine and p-synephrine works similarly as both compounds are stimulants.